Oils destined to be delivered to the cosmetic, culinary/food market, is usually filtered to eliminate tiny pieces of shell and fine seed pulp. Filtered oil is then crystal clear and will not leave any sediment layers in container tanks. This will help on down time during any clean up or change over requirements. 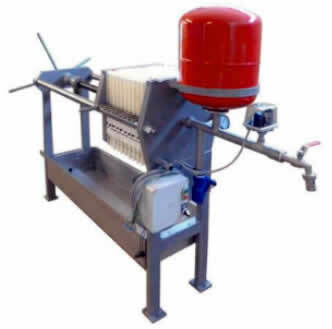 The Seed Oil Press Filters removes the need for sedimentation time and is used where the press or presses are run for long periods or continuously. With filters there is no need to allow the oil to settle, so no sediment in the bottom of the settling tank to deal with. 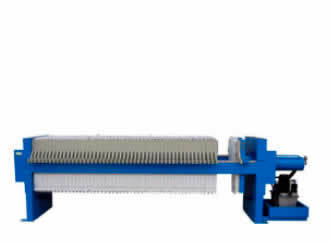 This filter has a high solids holding capacity, once full the filter is opened and the solids fall out, or are easily manually eased from the filter. A good match for KK Oil Prince and KK20. Plates: 200 x 200mm made of HDPP. Number of Filter Plates: 10.Filter surface area: 0.64 m².Chamber volume: Approx. 6 l.
Pump: Eccentric screw pump max 0,3 m³/h. Voltage – Standard Version: 400V-3phase. Voltage – Special Order Version: 110V-2ph | 230V-1ph | 230V-3ph | 460/480V-3ph. Police filter: Filter candle 20“, 1µm nominal, in Fine filter case. 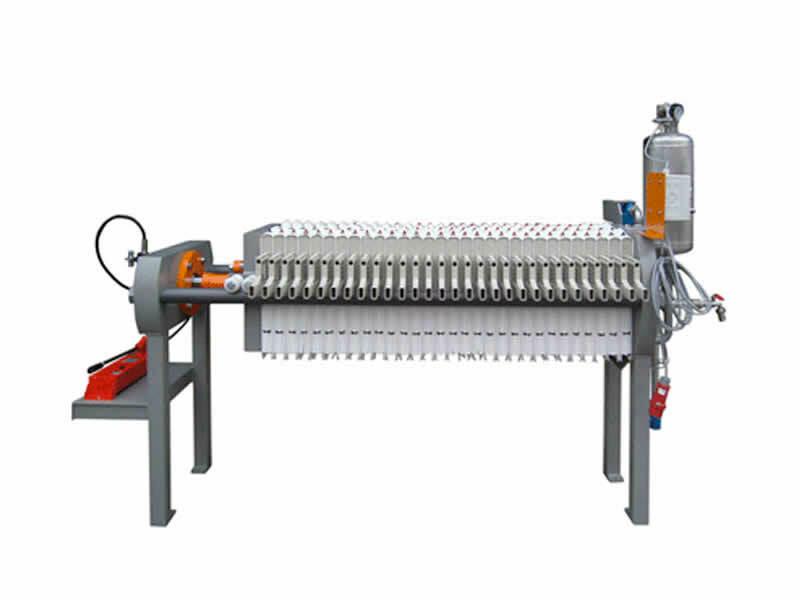 Further Information: Includes pressure control, suitable for to produce oil for foodstuff and cosmetics, electric wiring, CEKON 400V, filter plates fitted with reusable vegetable oil-specific cloth filter bags. Option: Safety equipment (pump switches off automatically after set period, automatic overflow switch-off). Filter plates: 350 x 350mm made of HDPP. Number of Filter Plates: 10 (can be increased to 15). Filter surface area: 2.3m² (can be increased to 3.5 m²). Chamber volume: Approx. 30l (can be increased to 45l). Pump: Eccentric screw pump 600 l/h. Police filter: 20“ candle filter, 1µm nominal, in candle filter case with pressure valve (optional). CEKON 400 V, filter plates fitted with reusable vegetable oil-specific cloth filter bags, pressure switch, micro-housing, conservator PN3, non-return valve, pressure gauge. Safety equipment (pump switches off automatically after set period, automatic overflow switch-off). Filter plates: 470 x 470mm made of HDPP. Filter surface area: 3,9m² (can be increased to 5,8 m²). Chamber volume: Approx. 40l (can be increased to 60l). 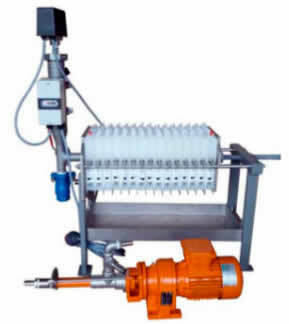 Pump: Eccentric screw pump 600 l/h Voltage-Standard Version: 400V-3phase. Police filter: 20“ candle filter, 1μm nominal, in clear sightedness candle filter case. 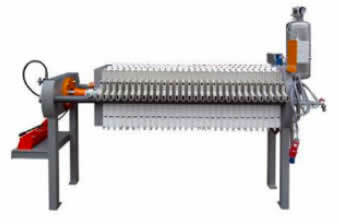 Other points: Includes residue tray, suitable for producing oil for foodstuff and cosmetic, pressure control, electrical wiring, CEKON 400V, filter plates fitted with reusable vegetable oil-specific cloth filter bags. Number of Filter Plates: 15 (can be increased to 30). Filter surface area: 6,3m² (can be increased to 12,6m²). Chamber volume: Approx. 60l (can be increased to 120l). Pump: Eccentric screw pump (1,2m3/h). Voltage – Special Order: 110V-2ph | 230V-1ph | 230V-3ph | 460/480V-3ph. Locking mechanism: Hydraulic high-pressure lock. Police filter: 20“ Candle filter, 1μm nominal. 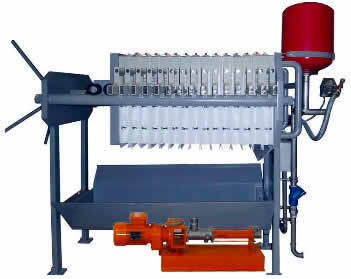 Other points: Includes residue tray, suitable for producing oil for foodstuff and cosmetic, pressure control, electrical wiring, parts which are coming into contact with the product are made of either stainless steel or plastic, filter plates fitted with reusable vegetable oil-specific cloth filter bags, CEKON 400V. Safety equipment (pump switches off automatically after set). Filter plates: 630 x 630mm made of HDPP. Number of Filter Plates: 20 (can be increased to 55). Filter surface area: 13m² (can be increased to 35m²). Chamber volume: Approx. 162l (can be increased to 445l). Pump: Eccentric screw pump (2,4m3/h). Police filter: Fine filter case size 2 (0.5m²), 1μm nominal, for 4 different fine filter bags and fine filter inserts. Filter plates: 800 x 8000mm made of HDPP. Number of Filter Plates: 20 (can be increased to 50). Filter surface area: 25m² (can be increased to 60m²). Chamber volume: Approx. 310l (can be increased to 780l). Pump: Eccentric screw pump (3,4m3/h).